A CH-53K King Stallion lifts a Joint Light Tactical Vehicle during a demonstration, Jan. 18, 2018. Using the single point hook, the helicopter hovered up to 100 feet for approximately 10 minutes while carrying the 18,870-pound vehicle. 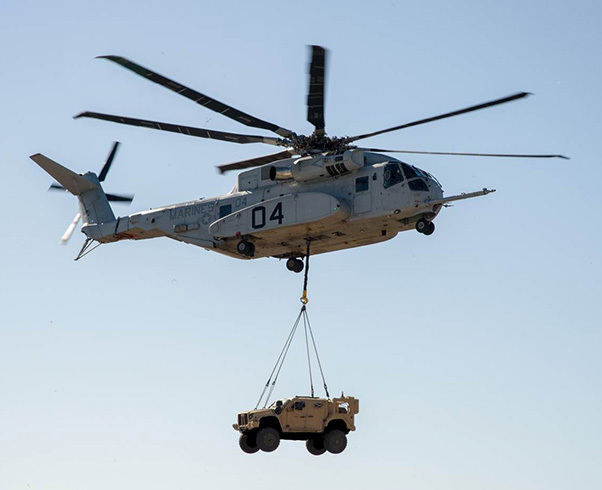 CH-53K King Stallion successfully lifted (and set down) a Joint Light Tactical Vehicle (JLTV) during a demonstration, Jan. 18, 2018, at Naval Air Station Patuxent River, Md. Using the single point hook, the helicopter hovered up to 100 feet for approximately 10 minutes while carrying the 18,870-pound vehicle. The JLTV family of vehicles are the Army and Marine Corps’ replacement for the High Mobility Multipurpose Wheeled Vehicle (HMMWV) and the CH-53K is replacing its predecessor, the CH-53E Super Stallion. The specific JLTV used for the demonstration was the four-seat model, known as the Combat Tactical Vehicle. Prior to using the JLTV, the program tested various external payloads on the CH-53K using representative concrete slabs, up to 27,000 pounds. This year, the test team will expand that external weight envelope up to 36,000 pounds. “The payload capability of this helicopter is unmatched, triple that of its predecessor and better than any other heavy lift helicopter in production,” said Vanderborght. The demonstration was a collaborative effort among the CH-53K Integrated Test Team (Sikorsky, NAVAIR and Air Test and Evaluation Squadron (HX) 21), the NAVAIR Internal Cargo Lab and PMA-261. In addition, the Helicopter Support Team from Combat Logistics Battalion (CLB) 25 traveled to NAS Patuxent River to support the demonstration, providing key ground support in the hook of the JLTV to the aircraft. It was the first time this unit had an opportunity to support both platforms. There are four Engineering Development and Manufacturing Model aircraft and a Ground Test Vehicle in test. 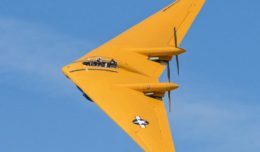 In addition, a sixth aircraft, known as a System Demonstration Test Article, joined the test program this month. To date, the program has logged more than 700 cumulative flight hours. About the aircraft: With more than triple the payload capability and a 12-inch wider internal cabin than the CH-53E, the CH-53K’s payload capability can take the form of a variety of relevant payloads ranging from an internally loaded High Mobility, Multipurpose Wheeled Vehicle or the European Fennek armored personnel carrier. In addition, it was designed to support three independent external loads at once, providing mission flexibility and system efficiency.